Welcome to the MISTI and Reverse Confetti Collaboration Blog Hop! Today the My Sweet Petunia and Reverse Confetti teams are showcasing just how fabulously the two companies work together to create some beautiful projects. If you've arrived here from Audrey Tokach's blog, welcome! You're in the right spot. If you haven't and would prefer to start today's hop from the very beginning, please click HERE. Today I have three cards to share. I just returned from Spring Break vacation with my family so I actually made the three cards for today's hop with the very limited supplies and die cuts I had packed along with me to Florida. 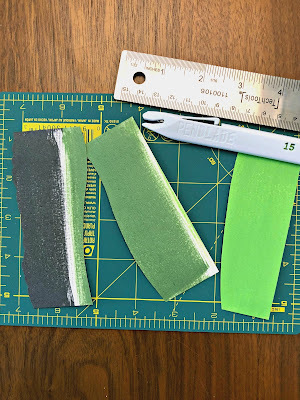 Although I do prefer to do my crafting with all my time saving tools and paper stash handy at home in my craft room, having less to work with made me get even more creative and stretch my supplies. I definitely packed my MISTIs with me. Those are my best time and sanity saving tools. I'd done my die cutting at home, so I just packed up my MISTI Studio bag with Reverse Confetti ink cubes, stamps and a minimal assortment of white papers and card stock, the Confetti Cuts die cuts, a few card bases and miscellaneous adhesives and tools. 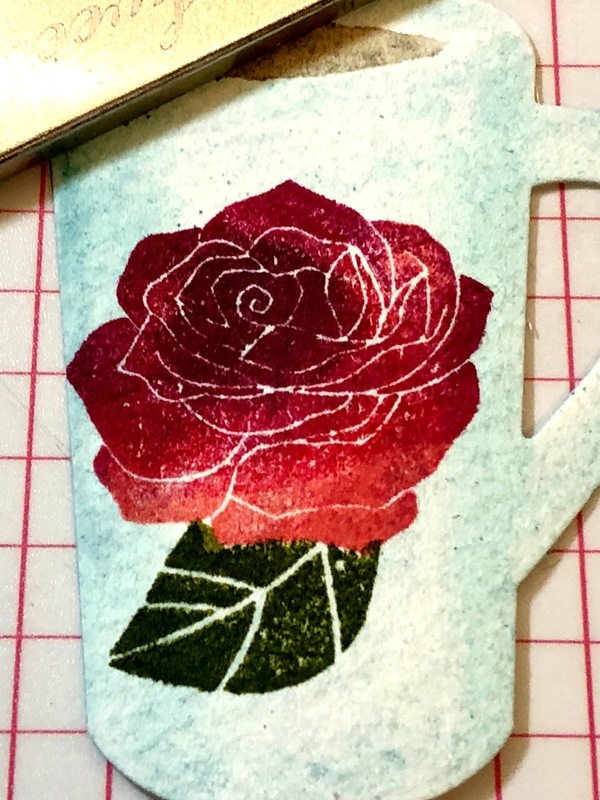 For my first card I used a few of the Confetti Cuts dies along with the Rose Garden stamp set. 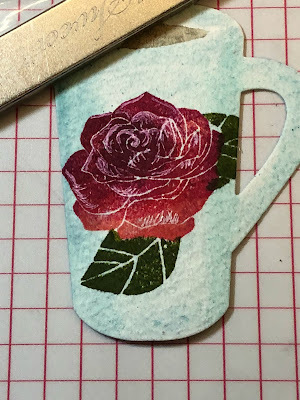 I had cut the coffee mug from Canson Montval watercolor paper using the Just Brew It Confetti Cut. I used the base of my Original MISTI as both my palette and painting surface. I smudged some of ink right onto the base and used a waterbrush to pick up ink and watercolored with the ink. Once my watercolor paper was fully dry, I used my MISTI and the little ink cubes to slowly add ink to my floral image. I lightly inked areas of the small rose stamp in tiny spots at a time, building up color, and leaving the outer petals lighter in color, and the flower center darker. I cut a mask from a Post-it note and used that to mask the flower so I could add the leaf images. I then added a little sketchy details with a white gel pen, which added a bit of extra highlight and definition to the edges of a few petals. I then began to work on the background for my image. I'd used the Sunburst Cover Panel Confetti Cuts die to cut a panel from white cardstock. I used Sunflower yellow and Sunshine ink to ink up the center of my sunburst, pulling the ink toward the edges with a foam blender. I'd saved the circle and inked that as well. 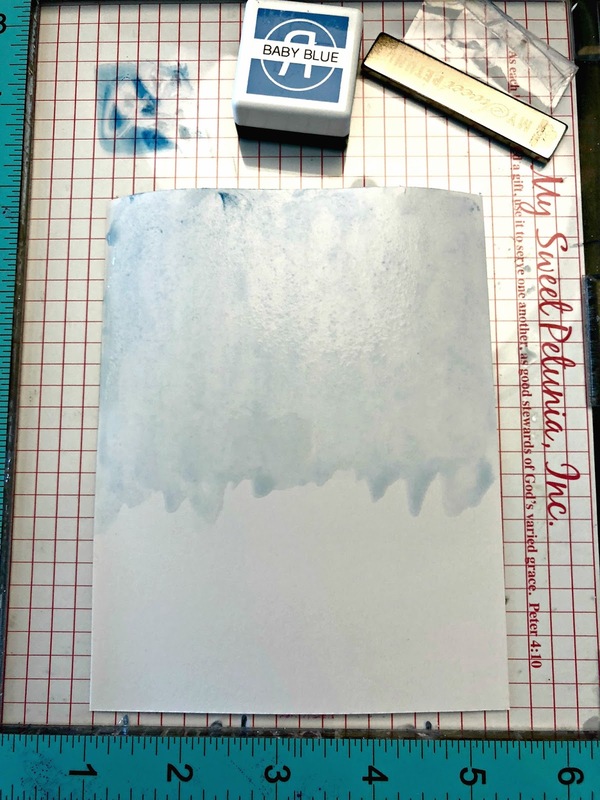 I needed a pale sky behind my sunburst so I used Baby Blue ink to watercolor a piece of Bristol paper. 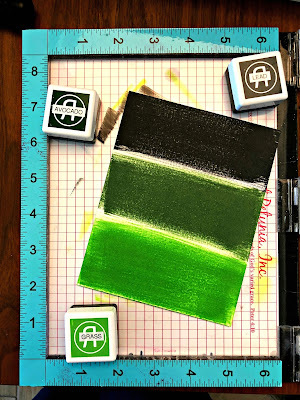 I also needed some small pieces of colored paper to create a horizon line as well as some grassy hills. I swiped the ink cube directly across the paper to color strips onto my white cardstock. Using a metal ruler, a PenBlade, and scissors, I trimmed the colored inked paper into the smaller shapes I wanted. All that was left was assembly. I used liquid glue to adhere all the pieces together, trimming the foreground pieces to fit within the outer edges of the Sunburst Cover Panel before adding to a yellow top fold card base. I used foam tape to pop up the coffee mug. The Confetti Cuts make some very simple yet stunning cards. 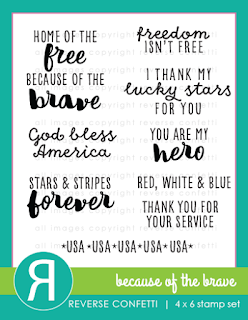 On the following card I used the Because of the Brave stamp set along with another cover panel. the Vertical Stripes Cover Panel Confetti Cuts. 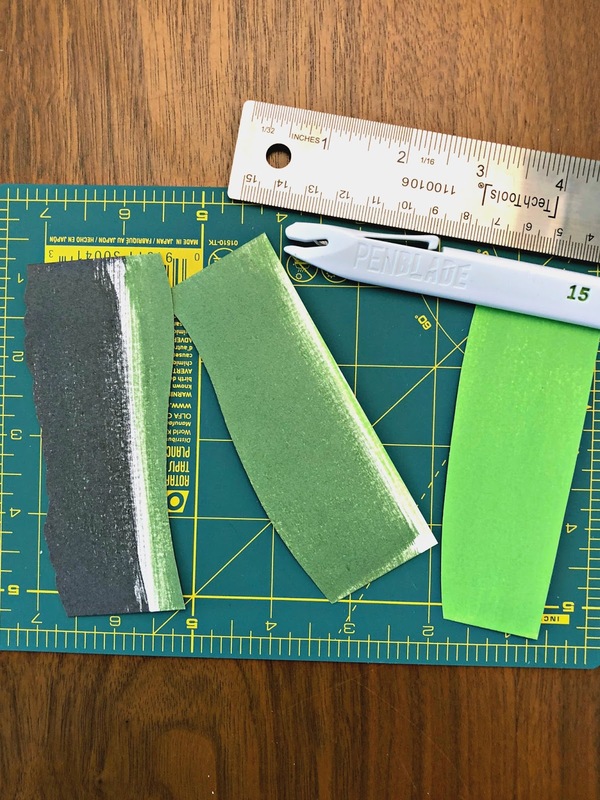 I'd cut the both the Seeing Stars and Vertical Stripes Cover Panel Confetti Cuts from white card stock, saving the inner stripes from the Cover panel. I trimmed off the outer edge off one side of the Cover panel die cut, so I could create a 13 stripe flag. I used the Rose ink cube direct to the die cut to color the frame and adhered it to a navy card base. I then glued the white inner stripes back in. 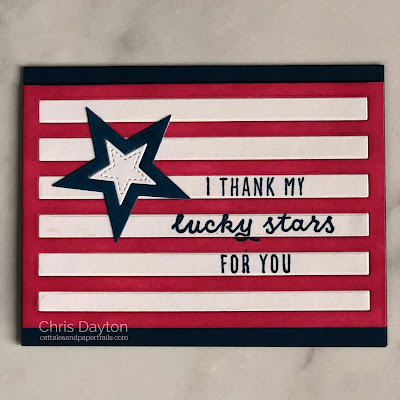 I used Post-it notes to mask off lines of the I Thank My Lucky Stars greeting, so I could stamp each line separately onto the white stripes with Navy ink with my Original MISTI. In the same manner as I colored the cover panel frame, I inked up the star directly from the cube with Navy ink and adhered to my flag, adding the white stitched star back into the center. 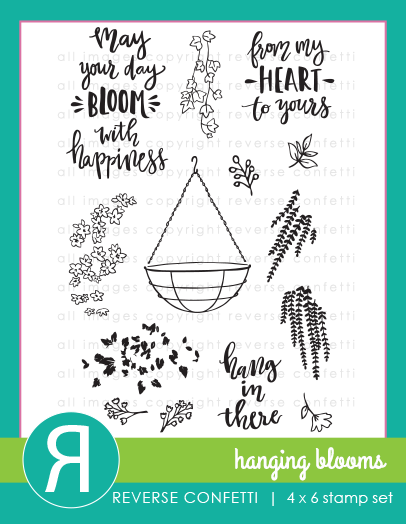 One final card for today used the Hanging Blooms stamp set. 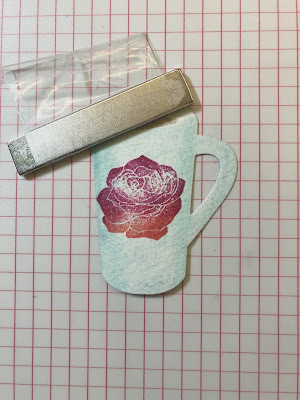 I started by using my Mini MISTI to stamp the wire basket with Versamark ink so I would have a faint guide for the placement of the flowers and greenery. I left the basket stamp in place on my Mini MISTI lid so I could come back to it and stamp it in again in the exact same place once my flowers and greenery were stamped. I used my Original MISTI to stamp the other images. I started with the \ flower image arranging and stamping it with Coral ink, then tucked the ivy image just under the flowers on the left. I then added the hanging fern-like image to the right with Grass ink, and again in Olive, using a Post-it note to mask the lower portion of the basket, so the Olive greenery would appear behind the basket. I then used water color pencils to color in the flowers and little hints of shadow and details to the greenery. I added two different green pencils to create the illusion of leaves amidst the coral flowers to fill in the basket. 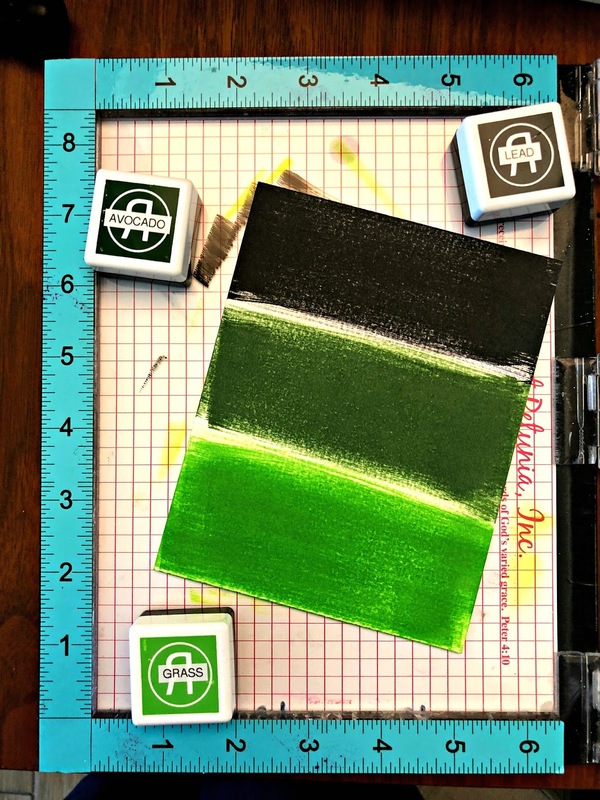 I then went back to the Mini MISTI and very carefully used the pointed tip of the edge of the Lead ink cube to selectively ink in the wire basket, inking tiny portions at a time, carefully avoiding inking over my greenery or flowers. I used Sand ink to add the hang chain of the basket, using a Post-it note to protect the top of my flowers from receiving any ink. I then sketched in a piece of timber using my watercolor pencils to create a beam from say, a pergola from which my basket would hang. I then added the Hang in there greeting with Rust ink. I trimmed my panel using a stitched rectangle die and matted it with green and a burnt orange scalloped die cut, before adding to a white card base. Thanks for joining me for today's hop. I hope you've enjoyed the hop so far. Your next stop should be Kathy's blog. But before you hop away, you are welcome to leave a comment to be entered into the prize drawings. Each comment left at today's hop blogs qualifies to be entered to win one of two prizes: a $60 shopping spree at www.mysweetpetunia.com and a $60 shopping spree at www.Reverseconfetti.com. You must leave your comments no later than Sunday, March 25th, at 11:59 PM Central time. The more you blogs you comment on, the more chances you have to win! 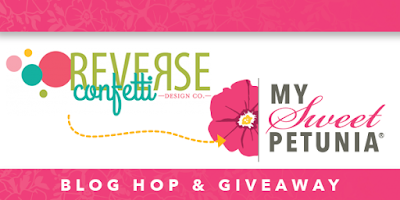 Winners will be announced on Tuesday March 27th, on the Reverse Confetti and My Sweet Petunia blogs. Wait, what? You made those stunning cards while on vacation, away from your crafting space? Color me IMPRESSED! Your cards are fantastic. Especially love the hanging basket. Great cards, Chris! I love reading about your process and seeing the steps you use to make them. And I love that sunburst coverplate die - on my wishlist! You did the basket without having to mask??? OMG. You are a master crafter for sure and I bow to you!! Love the Beautiful Day card, Thanks for the inspiration! Wow, what awesome cards - all! 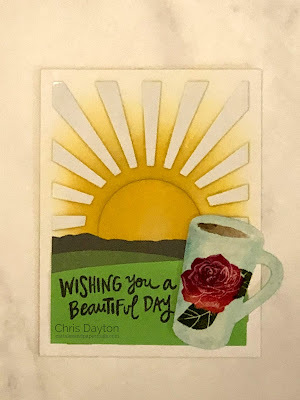 I hung on every word you printed on how you created your card featuring the cup with that beautiful rose. Thank you for all the details. I loved the suspense of the first card. I had no idea where you were going with your creation. Very creative layout. Wow! They are all just beautiful. Your cards are Amazing Chris! Wow! Love your sunshine, coffee card. Perfect technique. Thanks for sharing! Finally got to your blog-the link isn’t working for this page. But using my brain got here. I would never have space or any weight left over in my luggage for crafts to take on a trip, that is if we fly. So kudos to you!!! Cards are great you had me with the mug love it. 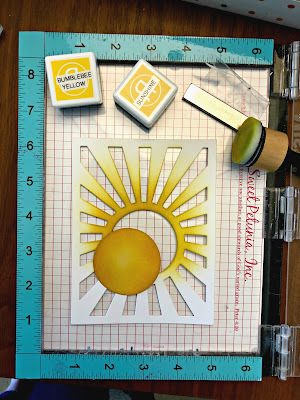 Love your sunshine card. Would brighten anyone’s day. Gorgeous cards! I really like the mini ink cubes, going to check them out. What a process! Thanks for sharing your lovely card! Pretty - thank you for the great photos to show us the process you designed! So pretty. Love all the details, colors, patterns, and designs. Each card is so unique and different. My favorite is the coffee one. Best way to start my day! Loved seeing a new way to use Rose Garden. All your projects are amazing! Wow!! You are so creative! Love how you used the die cuts in such clever ways!!! Fabulous "sun burst," "flag," and a great handmade wood perch to hang that beautiful flower basket!! These are wonderful, especially the first one! Wow, you are a true artist! Beautiful cards with just a few supplies! Love your basket of flowers & how you drew in the basket without masking. I don't like to mask so usually avoid a card where I have to use them. I love your rendition! Beautiful projects! I love how you created the coffee cup on your first card! Wonderful card designs. Love the one with the coffee cup. Jaw-dropping inspiration. Thanks for sharing such amazing ideas! Great cards! Loved seeing how the first one came together. Beautiful cards! Especially love that last one with the hanging basket!! Love to see such boldness! Great cards. Love the beautiful day. Thanks so much for showing your process. Awesome cards! 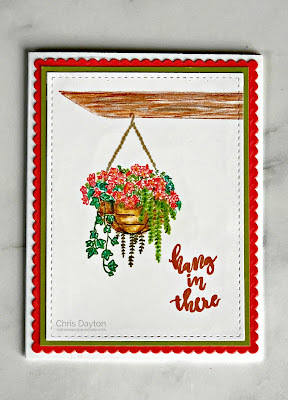 Love that pretty hanging basket image! Love your coffee cup, thanks for sharing your techniques! Chris I love your cards! Love the first one and the way you made the hills, such a great idea and the coffee cup is perfect! Beautiful job! what a wonderful set of cards!! Great cards! Such unique designs, and thank you for sharing your techniques on creating that sweet coffee card! Beautiful projects! I really like these stamps from RC. Nice variations of cards! Thanks for sharing! Had a hard time getting to your site using the link on the list but here I am, I actually outsmarted my computer...and happy I made it...your use of the MISTI was great! Beautiful cards! I love the rose on the mug! What a lovely variety of cards! 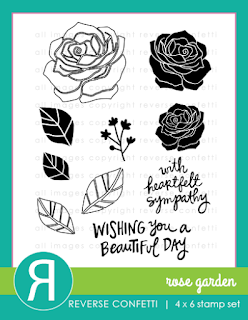 I love that Rose Garden stamp set! Thanks for sharing your amazing cards. The hanging basket is my favorite. Wow chris! Beautiful creations...you know I love that coffee card and what a gorgeous cup! I'd buy that cup! love how you used that background die too... awesome hand drawn timber to hang that beautiful basket from and very cool flag! Great cards -- very creative. 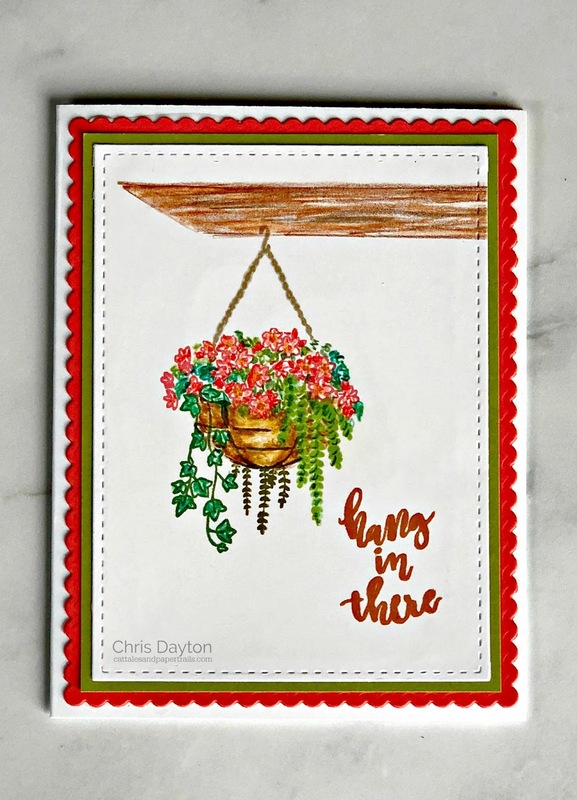 I loved the way you did the hanging flower basket on the third card. Thanks for sharing your ideas! I love seeing how you incorporated watercolor in with your stamped images. Your cards have a different feel than what I expected from MISTI stamping (which just goes to show how versatile it is! ), so thank you for sharing your particular brand of creativity with us! So pretty - love the layers and the die cuts and the hanging basket card is stunning. Fabulous, and very creative cards! Fabulous cards, Chris! Love the hanging basket~sooo pretty! These cards are all fantastic !! Congratulations ! !